They say the apple doesn’t fall far from the tree. So we set out to prove this on Saturday. While some of the tasks on our list were thwarted, we did manage to visit a local bookstore to buy some of the books I loved as a child. 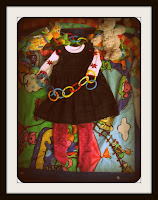 Until Sylvia is old enough to have favourites, she will have to share mine. 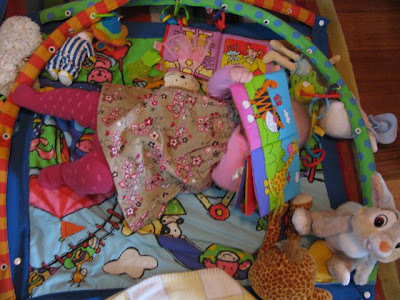 The books we bought her were The Very Hungry Caterpillar, Green Eggs and Ham, and Horton Hatches the Egg. I have always had lots of books around me and E, with both parents being librarians, has too. In fact, E’s family have all had book related jobs so I am glad to have student jobs in a bookstore and library on my cv. Many years ago my dad catalogued his books using the Bliss System, which always has seemed an impressive achievement. There is no doubt that Sylvia will have lots of books around her. Though maybe not quite as I knew them. I couldn’t find just a plain hungry caterpillar book like I read. There is one with a CD and a board book that I found and so Sylvia has a board book. Then with the Dr Suess books, I wanted hardback like I had but only flimsy paperback were to be found. When we arrived at the train station on the way home, we had a few minutes before the train left so E headed over to buy a Krispy Kreme donut. They were foutering about and we worried we would miss the train. So E came home empty handed. I told him I would make him some scones to have with his cuppa tea at home. 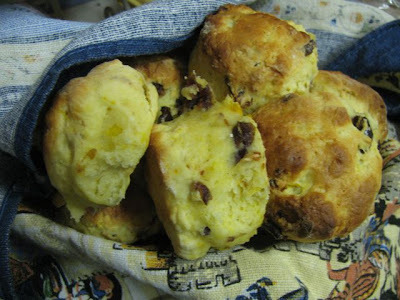 Cath Claringbold had shared an orange and date scone recipe from a little café in Melbourne (the Martin Street Café and Providore, 147 Martin St, Brighton) in a piece about daydreaming about living in the country. You know that ideal life where you can bake your own bread, make your own jam and walk out the back door to collect fresh eggs from your chookhouse. It sounds like what is known in the UK as an Aga Saga. A life without mobile phones, internet and twitter sounds idyllic, but I’d miss my blog. But it is a life that my great-grandmother lived. My mum was telling us recently about how she lived in the country and always had a kitchen table full of baking – scones, sponges and apple slices – whenever my mum visited. I don’t make sponges or apple slices, although my mum makes them splendidly, but I am very fond of baking scones. I love the idea that when I bake scones it connects me to generations of women in my family who have baked scones. Just as Sylvia will not have the exact books I grew up with, I will not enjoy scones in quite the same way my great-grandmother did. For a start, my mum said she never sat down because she was always so busy. I might have days where I run about like a headless chicken but I manage to sit down and enjoy a scone. I love plain scones, which my great-grandmother would have made but I also love them with a modern twist. Date scones are quite traditional. My mum would sometimes make them. So these orange and date scones seem to blend a little of the old and a little of the new. The scones were easy to make. They were soft and light when they came out of the oven and were still so good the next day that I ate them cold without butter. 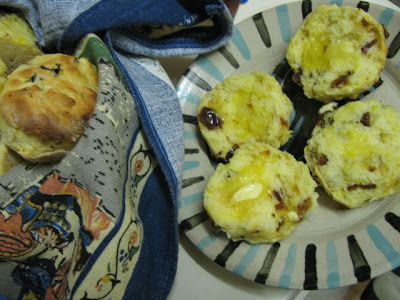 The orange flavour was quite intense and the zest gave them a yellowish colour quite unlike my mum’s date scones. But I did feel comforted by the smell of scones baking, wrapping the scones in a teatowel and watching the butter melting into the warm fluffy scone, so like in a the scenes of my childhood. The pieces of dates weren’t very big and I would prefer them bigger next time. I suspect E liked them small. He was most pleased with the scones. “Did your granny make date scones?” I asked. “No only plain or treacle,” he replied. I’d never heard of treacle scones before but am now keen to try them. Once the scones had quelled the hunger and satisfied the nostalgic yearning, I started on dinner. Here is where I radically depart from my childhood meals. 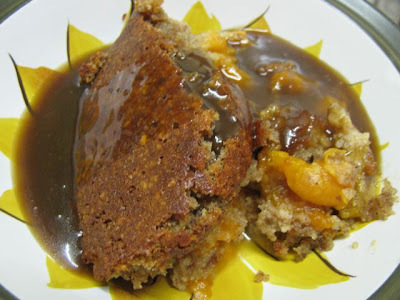 I looked in the fridge and used bits and pieces that needed using to create a pumpkin, carrot and lentil loaf. It was very nice and comforting with a soft lentilly mush. I could claim that it had contained some remnants of my childhood because I loved mashed pumpkin and cheese when young. But I don't know what I would have thought of it! The loaf was very nice and so I have included the recipe below as a work in progress. I decided to avoid breadcrumbs and nuts, which I usually put in loaves. Hence I was inspired to add pumpkin seeds to bulk it up a bit. They were surprisingly good, giving a slight crunch in the midst of the soft mush. I think I liked it so soft but did wonder if I should have made it firmer to be a loaf. It was almost a ‘pudding’ that you should dig a serving spoon into. We ate it in chunky slices. The first night I served it with chutney and broccoli but it was much better the next night with a home made tomato sauce and a simple salad of capsicums, cucumber and lemon juice. 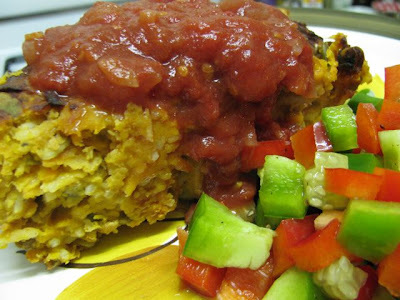 Great comfort food and quite healthy too. Preheat oven to 220 C. Grease a medium baking tray. Place flour, sugar, salt and chopped butter into a medium-large mixing bowl. Rub butter into flour with hands until it resembles fine breadcrumbs. Use a knife to stir in remaining ingredients to make a soft dough. Using floured hands scoop the dough out onto a floured board and lightly knead briefly til smooth – this should be only a minute or so as the less you handle it the lighter they will be. Use your hands to flatten the dough to about 2cm high (or ½ inch) on the floured board. Dip a scone cutter (or the lip of a drinking glass that is about 5cm in diameter) in flour and cut out scones with it. Lightly knead the scraps, flatten and cut out more scones til you have used all the dough. Use a pastry brush to brush a little extra milk on each scone. Bake for 15-20 minutes at 220 C (I baked mine for 10 min at 200 C and then 10 minutes at 230 C and then I put the scones from the middle of the tray back into the oven for 5 minutes at 230 C). They are cooked when golden brown on top and slightly browned on the bottom and sound slightly hollow when tapped on the bottom. Wrap hot scones in a teatowel. They are best served warm with or without butter. But they are still good the next day. They can be se can be frozen and reheated in microwave or oven. Preheat oven to 200 C. Grease and line a loaf tin (about 13 x 25cm). I used a silicone tin and didn’t grease or line but the mixture stuck to the sides a bit so next time I would use a metal tin. Place lentils, stock, shallots and garlic in a small saucepan. Bring to the boil and simmer with the lid on for 15-20 minutes until the water is absorbed and lentils are soft. Meanwhile steam the pumpkin in the microwave til soft – for about 5 minutes. Drain well (water is released during steaming even when no water is added to the pumpkin) and mash pumpkin with a fork. Mix lentils and pumpkin with the remaining ingredients in a bowl. Spoon into prepared loaf tin and bake for about 1 hour and 15 minutes. This is a very soft loaf and was even better the next day when reheated at 180 for 30 minutes. Serve with a good tomato sauce and a simple salad. 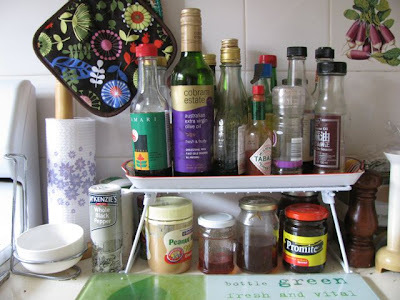 Last week I had a kitchen disaster worthy of Bridget Jones. Yes, you know the book (or movie) I am talking about. It was lightweight and silly but fun. In fact, it kept me entertained as I waited for E to finish work at a bookstore many years ago. I just read a bit every time I was there. Don’t worry I didn’t leave a bookmark in my copy or turn down a dog ear corner. I just remembered where I was up to. The moment in the novel I am referring to is when she makes blue soup because the string she uses has blue dye in it. She couldn’t cook and drank more than was sensible when trying to concentrate on a new recipe to impress a special gentleman. Well, imagine if we fast forwarded many years to when she is married, has a baby, knows how to cook, doesn’t drink much anymore, and is tired and distracted. That was where I was at last week. We all were snuffly and slept badly. Sylvia was starting on solids and had to have her immunisations (she was so good she barely cried before charming the nurse and doctor with her smiles). And I was missing my mum and dad who are travelling. So I decided to make a tart that looked simple enough. 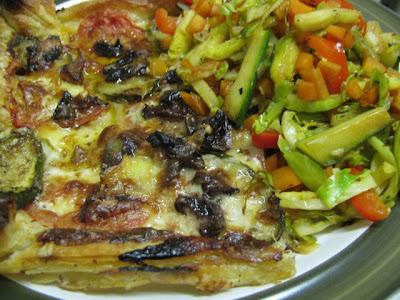 It was just a matter of layering some cheese and vegetables on puff pastry. Hard to mess up, you might think. So what did I do wrong? When it was cooked I took it from the oven, admiring the golden brown pastry and bubbling cheese. 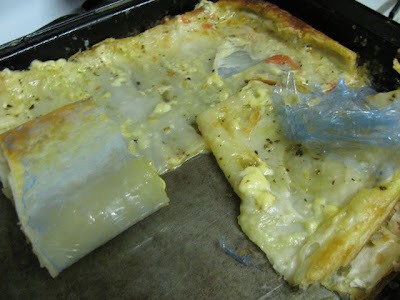 I slid the eggflip under the pastry only to find I had left the blue plastic packaging on the puff pastry. I had put the pastry, with blue lining, on the lamington tin to defrost and forgot to remove it when I came to placing the toppings on the tart. Oops! 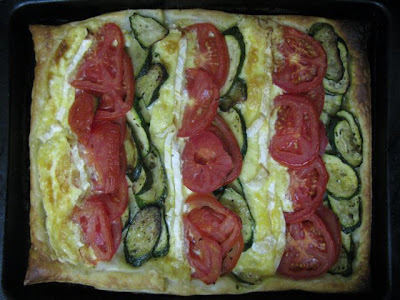 I had actually not managed to fit all the fillings on the tart and used a third sheet of puff pastry in a smaller tin to scatter a few bits of brie, tomato and zucchini, some olives, walnuts, a drizzle of cream and some grated tasty cheese. I baked this for 30 minutes but when I discovered my blue plastic disaster, I had only put this in the oven. I was hungry. After much sighing and hand wringing, I couldn’t wait any longer for dinner. I scraped the vegetables and cheese off the tart and a little pastry that hadn’t had the liner on it. It looked a mess. But when you are hungry it doesn’t matter how it looks. So I put my broccoli on the side and gobbled it up. It was delicious. I loved the roasted vegetables with melty brie and crispy pastry. The next night we had the leftover tart, which was also very good but very rich and needed all the vegies on the side. The tart was so good and simple that I decided to post the recipe anyway. It can be simple as in the recipe or more complex if you want a little experimentation as I did with my second version. I highly recommend either, but just remember to remove the lining from the pastry. Preheat oven to 200 C. Line a lamington tray (30 x 20cm) with puff pastry sheets (making sure the plastic lining is discarded!). Use a sharp knife to score a line about an inch or 2.5cm from the edge. 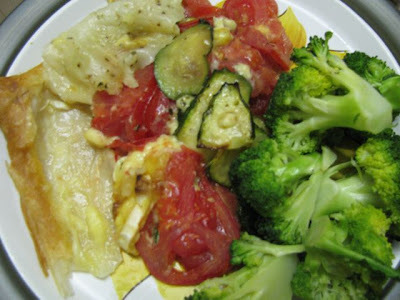 Slice brie, tomatoes and zucchini in ½cm slices. 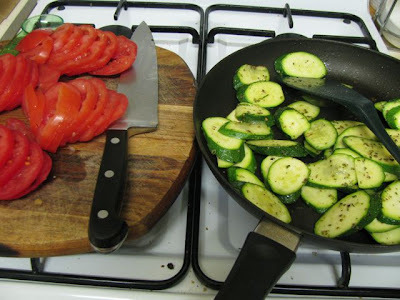 Heat oil in frypan and fry zucchinis at medium heat for 2-5 minutes till softening. Add oregano, season to taste and fry another 1-2 minutes. (My zucchini slices were slightly browned on some and I don’t think it was too cooked) Cool slightly. 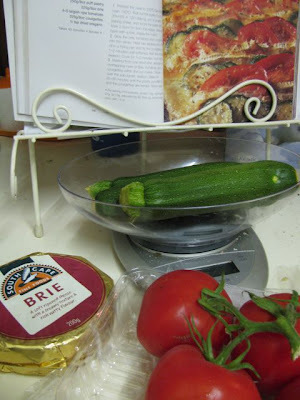 Arrange brie, tomato and zucchini in three rows and then repeat 2 or 3 times. Bake for 25-30 minutes till tart is golden brown. Serve with salad or steamed vegetables or roast vegetables. 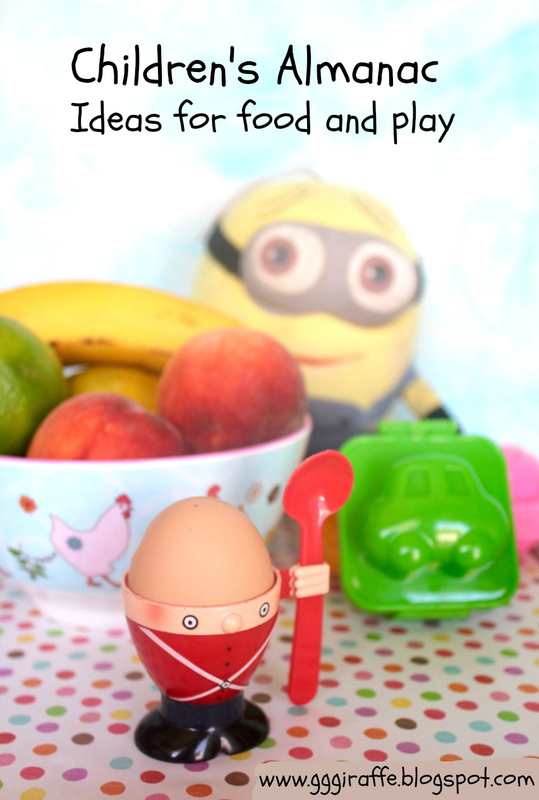 Today I am sharing a quirky smoothie, some housekeeping information and a question about cocoa. Housekeeping, you ask! Not housework. I mean blog housekeeping. But let me start with the smoothie. It is a quick one that I made using what was in the fridge. I called it Strawberry Cheesecake Smoothie because I have both cottage cheese and toffee sauce in it. I initially imagined the banana and toffee sauce as a sort of banana split smoothie but the strawberries needed to be used and the cottage cheese seemed interesting because we were out of milk and yoghurt. I might try it another time with cream cheese for a real cheesecake taste. It wasn’t as overly sweet as I feared but was creamy and subtly fruity. Delicious with gingerbread bush buddies. Now onto the housekeeping. The longer I have this blog, the more I want to organise all the information. Lately I have had three pages I have wanted to post. I have finally got them up in a burst of energy because I know busier days are coming. The first page is an Index by Ingredient. I have had a Blog Index (by category) for a long time now and I use it a lot but I have also wanted to have one to inspire me when I have a fruit or vegetable and want ideas on how to use it. This new index is not complete because I have tried to include the best or most relevant recipes to keep the list from getting way out of control. 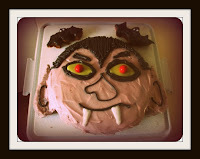 (At last count there were over 400 recipes). 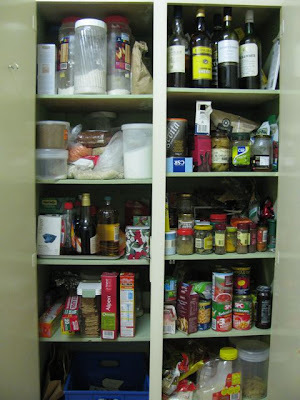 More work is needed and when I have time I would like to add more ingredient categories and more recipes. It probably will not be updated as often as my complete index but I hope you will also find it a good alternative way to seek recipes. The second page is Kitchen Notes, Ingredients and Substitutions. Call it cultural cringe or cultural pride. I feel I need to wave the Australian flag on the internet and also to provide some clarification on the terms I use. I need to work on this page more but I find it useful enough to want to post it. I want to alphabeticise the translation list but the html needed to do a table was stretching my ability and patience with the blog. (You will notice this if I haven't fixed the spacing by the time you read this.) I will get back to working on it soon, I hope. Please let me know if there are any terms or information you think would be useful for me to include. The third page is the About Me page. I love looking these up when I go to a new blog so it seems only right that I reciprocate. As you can see by this post, I am not good at short and pithy but – hey – it is my blog and I love to write. I even had some self-indulgent fun with photo editing. I particularly wanted to update it because the long-winded About Me Part One and Part Two were written before Sylvia arrived. I still would like to find a few other photos and put in a few links but it is ok to go. My life has changed so much since I started the blog that I wonder if I will soon have to rewrite this page to keep it updated. Will do my best to make sure it doesn’t lag too far behind my ever evolving life. Lastly, my question. For the Ingredients list, I have done some searching around the web for words I come across that aren’t the same as the terms I use. One of these is ‘Dutch processed cocoa’, which seems common in America. I have read a few things about it lately and it seems that it is milder, alkalised and containing less antioxidants than regular cocoa. I always thought the Dutch cocoa we buy here is richer and quite posh. I don’t always use it but do sometimes to get a dark intense chocolate flavour but now I am wondering if I should heed when recipes specify no Dutch processed cocoa. I have tried to find if what we call Dutch Cocoa is the same thing. 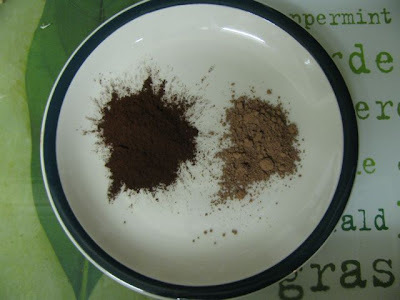 I have photographed my plain cocoa next to the darker Dutch cocoa (Equagold brand). I wanted to clarify it on my ingredients page but need to clarify it in my own mind first. Can anyone help me with this? Now I am off to update the navigation menu at the right hand side. As an Australian on the big world wide web, I sometimes feel that the terms I use are difficult to understand for those outside our country. We use a strange hybrid of English and American terms and ingredients. So I have cobbled together a list of terms and translations for both Aussies venturing abroad and for those trying to understand Australian cooking and my cooking. This information is intended to be useful rather than definitive. It is a work in progress so I will continue to tidy it and add links where helpful. (Apologies for the dogdy spacing right now - I am trying to fix it but my html skills are limited so this table is a challenge.) 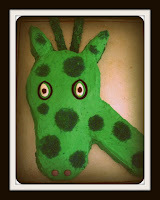 Any corrections, questions or comments can be sent to me at gggiraffe07[AT]yahoo[DOT]com[DOT]au. My methods: I am a slapdash cook. 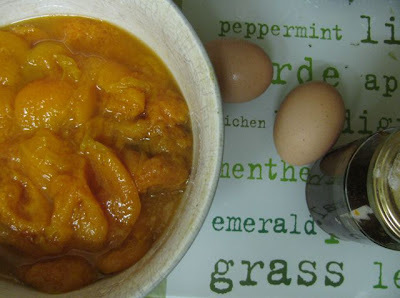 My blog has shown me how much I tweak recipes as I go and I try to reflect that in the recipe I write out on this blog. I believe that in baking once you know the rules you can break them. I have been baking long enough to have a feel for how things work - though I still occasionally have a cake which comes out of the oven uncooked on the inside. But I just put it back in the oven. My mum tells me I must not change anything in a sponge cake recipe. I often adjust ingredients depending on what I have in the house. I share what I do rather than what I should do, but with some reflections. My oven - My oven is an old gas oven (and not fan-forced). 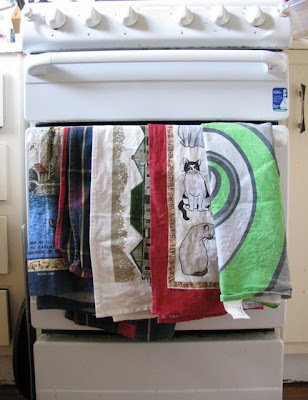 I don't always preheat but try to when I am organised. I notice I often need more time in the oven than recipes specify. Having used new electric and gas ovens, I am aware that others may need to take this into account when reading my recipes. My oven cooks unevenly. I used to use a large baking tray but have recently bought two smaller trays which I find much easier for rotating cookies/biscuits or mini muffin trays for more even baking. Lining cake tins - In my recipes I often say grease and line the tin. This is what I usually do - I spray the sides of a cake tin with oil (light olive oil) and use baking paper to line the bottom. If it is a square or oblong cake tin, I just let it go up two opposite sides. If it is a round cake tin, I cut out a circle of paper for the bottom. If I am using silicone cake tins I don't grease, oil or line the tin. Measurements. The measurements I use are Australian cup (1 cup = 250ml) and spoon measurements (my tablespoon is 15ml which may not be an Australian measure), and/or metric. For conversions, go to Real Food for Real People or Gourmet Sleuth.Sometimes I say a handful or a sprinkle of an ingredient because it is not important to have an exact amount and you can adjust it according to whim and desire. Dutch cocoa - this is a dark better quality cocoa - I am a little confused about how it compares to the American dutch processed cocoa which seems a lower quality cocoa. Milk - I use low fat milk. I don't really like the taste of milk so I let E choose the milk we have. In an ideal world I would have vegan milk occasionally but we don't use it enough to justify buying two milks. Onions - I always use brown onions, unless otherwise specified. I don't usually say peeled but I always peel them. Pumpkin - we have pumpkin all year round and in all shapes and sizes - but I have learnt that in America/Briatin some of what we call pumpkins are winter squash - for example our butternut pumpkin is American and Brits Butternut Squash. We use Queensland Blue, Jap and Kent pumpkin a lot - they are large pumpkins with blue or dark green skin - they seem quite like kabocha squash - see my pumpkin post for more info. Mixed herbs - I buy a commercially dried mixture of Thyme, Rosemary, Marjoram, Basil, Oregano, Sage. Market Fresh - photos of vegetables and when they are in season in Australia. UPDATE February 2010 - I have archived this page and will make any changes on my new About Me Page. That’s me! I am not really gourmet but I do love cooking. I am neither tall nor slender as a giraffe (just in case I had misled you) but I do love to surround myself with giraffes and green things. I learnt to cook from family and friends and by trial and error. I became a vegetarian in 1991, so tofu seems more normal than chicken to me, though I had a meat and three veg childhood. At university I studied history and literature, and on this blog I have been delighted to find it is fun to write about how these interests relate to food. In fact, I have found most things can have some relation to food – current affairs, my daily life, family history, music, television, popular culture, offbeat topics, rants, all find their way here. 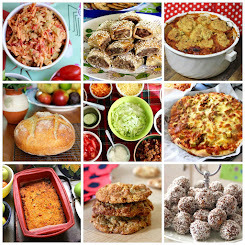 I love sampling new foods, revisiting old favourites, baking cakes, and trying quirky recipes. Our cat. We were lucky to be given her by a friend who, sadly for her, couldn’t keep her. She has such a lovely character. Our friend found her in the lost cats home aged 2. They should have put her down but couldn’t bear to because she was so loveable. I am constantly grateful for that. She has been solace in difficult times and brings us great delight. I used to say I would never have a cat and now our home would not be complete without one. Our daughter who was born in 2009. She is a beautiful baby with lots of smiles and happy squeals. It is such a joy to see her mysterious potential unfurling. You will glimpse her on the blog and as she begins to eat more solids I will be interested to see how it will affect what we eat in the house. Last but not least, I love sharing food – and sometime the cooking – with my friends either when eating out or in our homes. I have learnt a lot from friends about food and cooking, especially in shared households. More recently I have learnt so much from my blog friends that I wish I could invite you all over for a big blog dinner party. Given that this is not possible, I try to join in blog events where possible – our virtual dinner parties! 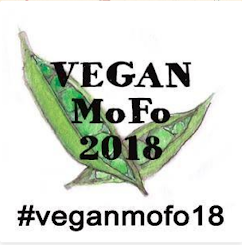 You are welcome to contact me with questions or comments at gggiraffe07[AT]yahoo[DOT]com[DOT]au (but bear in mind that I do not do link exchanges or product reviews). I was on the phone to my 4 year old niece who is celiac and thus eats only a gluten free diet. She asked what I was having for dinner. Gluten free pasta with potato and cabbage. Yuk! So I asked what she was having. Fish and chips, she told me gleefully, they’re my favourites. Fortunately it was easier to sell this to E. I just told him it was a little bit neofolk. 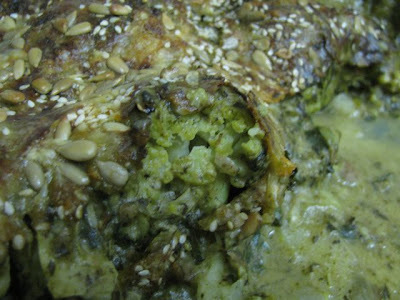 What with dark cavolo nero (black kale) and Eastern European buckwheat and caraway, it is not difficult to imagine it as part of a neofolk banquet in a gloomy medieval dining hall. I found the recipe last year at a B&B while on holiday in Philip Island. I love browsing recipes anywhere and delight in unusual and interesting combinations of flavours. This pasta bake was something I never would have thought of but makes so much sense. I remembered it when I discovered the O’Hea Street Bakery and Deli sold fontina cheese. I tried a gluten free pasta for the first time last year when I had mung bean pasta with broad bean pesto. I was not impressed. 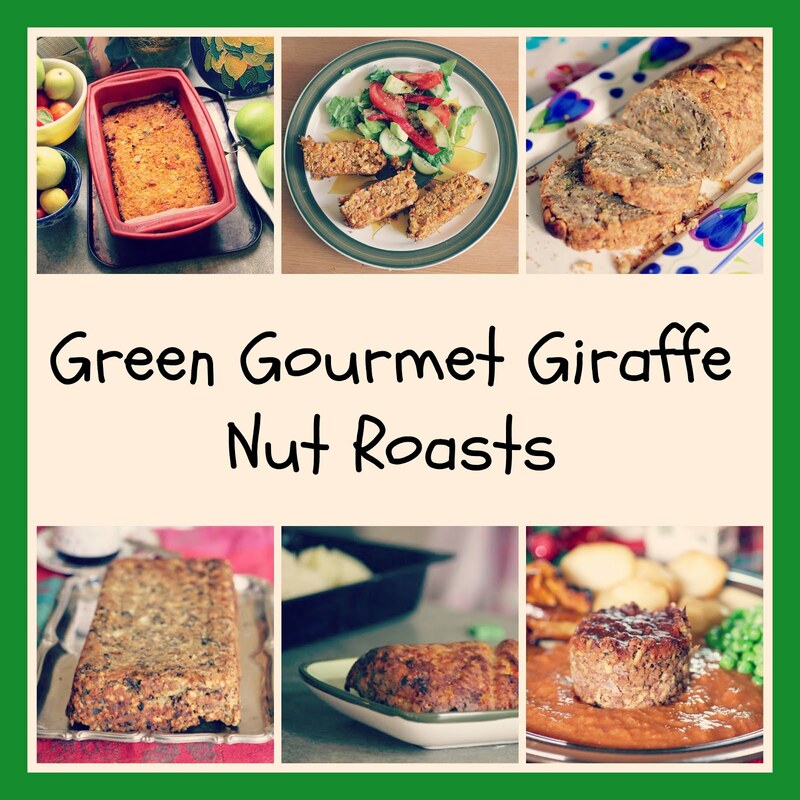 The more I try gluten free recipes I have found that it is not always a matter of substituting gluten free flour or pasta for the wheaten version. Sometimes it works but not always. I have been enjoying buckwheat flour lately and was not surprised to find the pasta bake most pleasing, although maybe it is just that I tried it in the right way. The recipe did seem light on seasoning but it was very tasty. Salting the pasta water and potato water seemed to help. Next time I think I might try some smoked paprika in it, and if I would love more cheese and walnuts – but that will depend if I am needing more protein or less fat in my diet. The other caution I will give you is that it needs a large baking dish. I used my large roasting dish and mixed it in the dish to avoid despairing over my lack of a monster-sized mixing bowl. 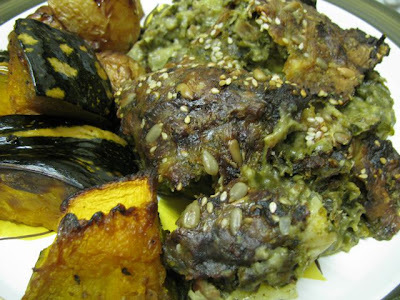 The joy of this recipe is that it will feed a crowd or feed a small household for a few days. And that is good thing! Especially in windy wet weather such as we are having today. But fear not, the news might be telling Melbournians to bunker down with fierce rain and wild winds expected (telling people to leave work early), but we have split pea soup for dinner and I am planning to bake more of those bush bickies. I am sending this to Helen of Fuss Free Flavours who is hosting this week's Presto Pasta Night (#128), an event founded by Ruth of Once Upon a Feast. Cook potato in salted water for about 15-20 minutes or until potato soft. Cook pasta in boiling salted water according to packet directions. Add kale to cooking pasta for the last few minutes. Drain. In a large frypan, heat oil and fry onion, carrot and leeks for about 5 minutes. Add garlic and mushrooms for 3 minutes and then cumin and caraway for 1 minute. 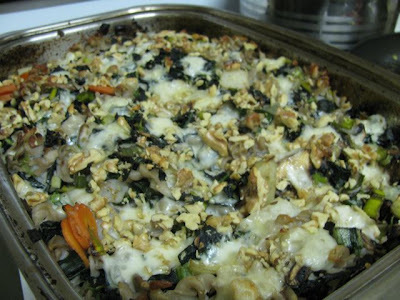 Place everything, except cheese and walnuts, into large baking tray and mix well. Check seasoning. Sprinkle cheese and walnuts over the top. Bake for 30 minutes at 200 C or until cheese is melted. Beware! Work in Progress ahead! Probably not child friendly! Life is work in progress. We all know that we are constantly growing, evolving, changing. But that is really brought home to me as I watch Sylvia grow. 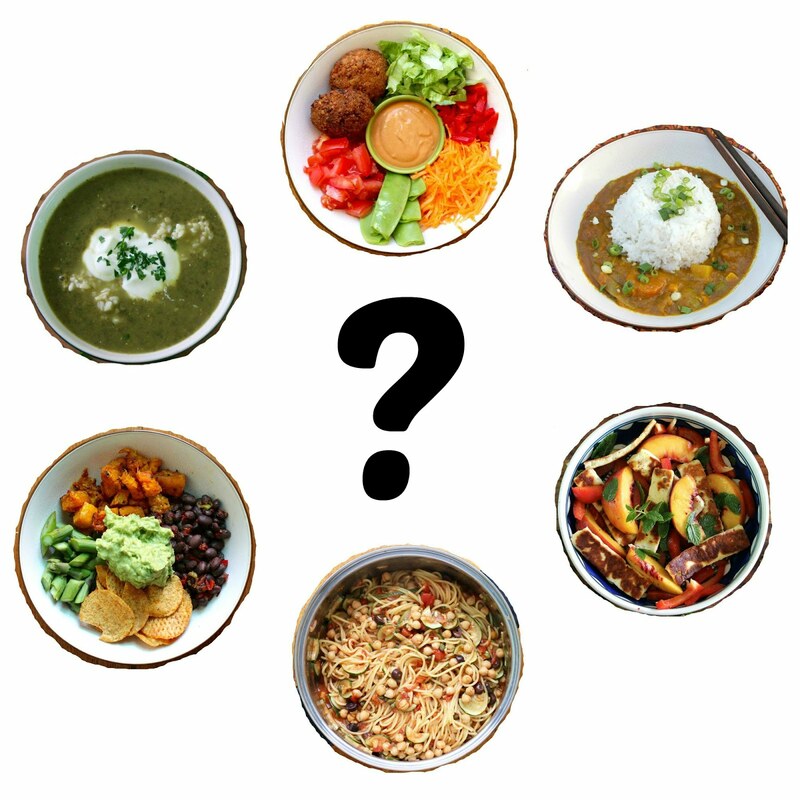 When I started this blog I didn’t know just how much the focus on food would reflect the twists and turns of my life. Today I am keenly aware of how food is closely interwoven with the changes in our lives because yesterday Sylvia had her first taste of solid food. Well you and I might question if rice cereal mixed to a sludge with milk is actually solid but compared to the milk she has been feasting on for the past 6 months, it is quite solid. With this small change in her diet comes all sorts of new challenges – more cleaning, more laundry, more cooking, dirtier nappies, and a never ending list of new foods to try. I was quite reluctant to start her on solids. The high chair sat in pieces for weeks but now is modelled in its pristine glory by our wee giraffey. 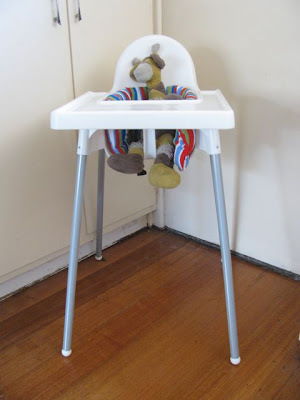 The word on the street was that this Ikea high chair was the simplest, particularly when it came to cleaning. So we had the high chair, the bibs, the baby rice. As I expected, food was all over her face, her bib and the tray even after just a few spoonfuls. I am not sure much of it went into her tummy. Sylvia might turn into a control freak like all the women in our family because she was keen to take control of the spoon. There is no turning back now. No longer is she my wee newborn baby. She is growing up and changing every day. Full of potential and mysteries. Solids brings up all kinds of question. What food will she like? Will she have allergies? 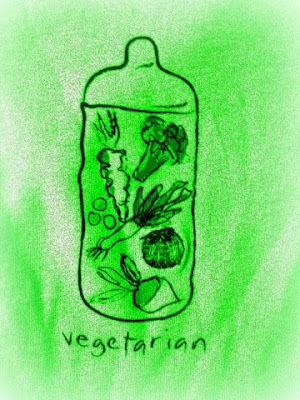 Will she want to be vegetarian? I have been pondering such things lately. Anyone who has read this blog regularly will know that E and I don’t always see eye to eye when it comes to food. He wants butterscotch and I don’t understand why anyone would want just butter and sugar when they can have chocolate, fruit and nuts. I get dizzy with excitement over black kale and he says it is ok but he leaves half of it on the side of his plate. He pours Tabasco sauce over any meal he can while I am a scaredy cat when it comes to chillis. So I wonder what will Sylvia like and dislike. Will she be different from both of us or do we have a mini-me in our midst when it comes to food? One more thing I expect is that, with her starting to eat solids, it will change what we eat at home. Not immediately. Neither of us is keen to sit down to a bowl of baby rice with her. But the day when we share dinner with her seems to come ever closer. I know that kids and food can be a challenging combination. One of my nieces loved pasta with no sauce. I remember going out for dinner and asking the staff to make her plain pasta. They brought out pasta with oil through it. My niece refused to eat it because it was not plain enough. Even now she prefers to prepare her food separately rather than to mix it all in a stew. Another of my nieces is horrified at the idea of a vegetarian diet. When she was little she used to ask questions like, are apples vegetarian? 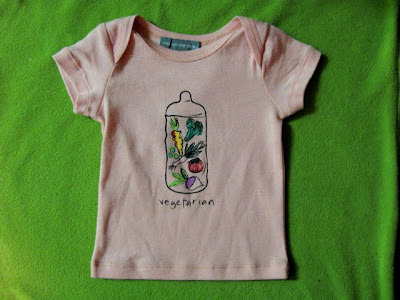 I liked to tease her by reminding her that she was vegetarian once before she started eating solids. And then there is my niece who is a celiac and must avoid all gluten. I am not sure how Sylvia’s eating will affect the food I write about on this blog. 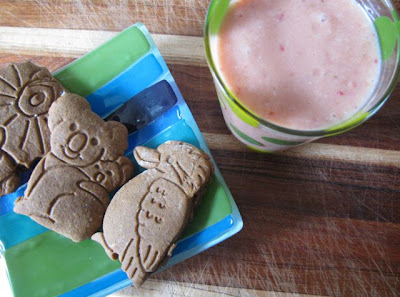 I am sure there will be a few more cute biscuits like the bush buddies gingerbread. But I don’t know how she would react to some of my more complex flavours and eccentric creations, once she is eating with us. What I hope is that she will believe it is normal to eat lots of fruit and vegetables, that it is necessary to cook and bake, and that it is fun to taste lots of interesting food. A problem with being a little adventurous in cooking is that it can be a little bit hit and miss. Not everything I cook makes me swoon. Fortunately I have enough experience to think of how to rescue a recipe. Unfortunately, the rescue doesn’t always work. Ah well! You can only try. So today I will share a few of my work in progress dishes where I have recycled some dips which I was unsure about, attempted familiar dishes in unfamiliar ways and have considered further developing recipes. I wanted to record these because even though they are not perfect, they have potential that I wish to revisit some time in the future. I am not sure if Sylvia will be keen on me revisiting them. (Be afraid, little girl!) Time will tell. There are six recipes here in two groups of three. (I am determined to get this blog backlog under control.) I share them to record them and to hope to inspire others to experiment with the ideas. In fact, many of the recipes are have quite approximate quantities because they can readily be changed according to whim and availability. The first group started with a beetroot dip that was nice – mellow and lots of depth of flavour. More like a pate than a dip. I was trying to avoid the sharpness of lemon juice but then I found I needed it anyway. Next time maybe I will try adding rhubarb (see Lysy’s beetroot and rhubarb soup to see where I got that inspiration from). It grew on me over time but initially I was disappointed. 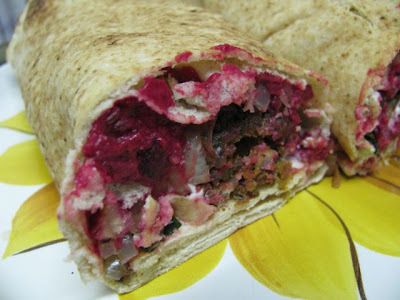 So I turned it into a falafel wrap with beetroot and kale. The kale was all I could glean from the garden but I wished for more. It was a great winter alternative to the traditional lettuce and tomato accompaniments. Just to prove he is contrary, E didn't have his wrapped but ate his filling with a knife and fork and put his pita on the side. 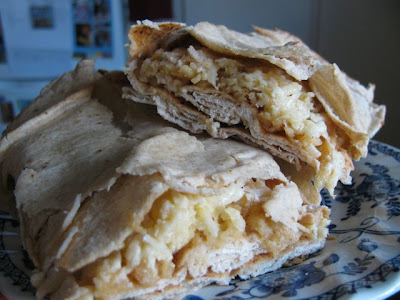 I then had some pita breads left over that became Apple and Cheese Pita Wraps. I had been inspired by Cindy’s Apple Quesadillas. They were crying out for cheese. I had tried apple and cheese in a cake recently and the cheese was not prominent enough for me. I wanted to try this with tortillas but the pita breads had to be used. The pita was a little crumbly, the apple a little drippy and browning at the ends. I wondered if I should have added a squeeze of lemon juice and if I should have squeezed some of the juice of the apple. I liked the idea and hope to experiment more with this. The second group of recipes is from this weekend. I made Ashley’s Spinach and Artichoke dip, It was a bit wet and slimy with all the spinach and basil but I re-read the recipe and discovered I should have paid more attention while making the dip. I threw the artichokes in the blender with the other ingredients but they should have been finely chopped and stirred into the mixture that had been blended. D’oh! I have been eating it as a dip – with chutney and cheese – but it seemed a lot to chomp through. I was not daunted once I starting to dream about how I could transform it into dinner of some sort. I had many flights of fancy – blended with tofu and nutritional yeast flakes in a pasta bake, combined with lentils and pumpkin in a casserole, in a potato gratin. I later saw that Ashley had baked hers with feta cheese. But I finally settled on revamping my mum’s cauliflower cheese into a Cauliflower and Fennel Gratin. 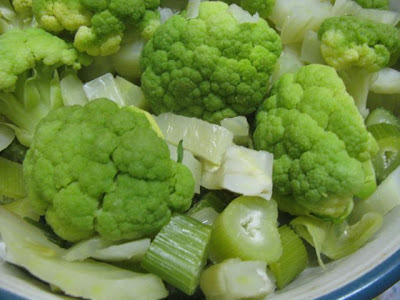 I had found a gloriously green cauliflower and bought some cheap fennel. I cooked them up, made cheese sauce, stirred the dip through the sauce and topped it all with crunchy seeds and bread crumbs. It wasn’t as green as I had hoped but it was delicious and unexpectedly substantial. I served it with roasted potato and pumpkin. Finally, I made Apricot and Almond Sponge with Toffee Sauce for sweets (that’s dessert or pudding if you don’t speak my lingo) to follow the fancy cauli cheese. My mum had found me a jar of stewed apricots she had put away. It has sat on my bench for weeks. 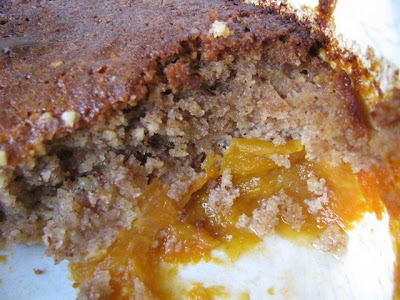 It went into this gluten free version of my mum’s apricot sponge. I also added some spices and some of my mum's marmalade. It was dark and dense rather than light and fluffy. I liked it but wished I had ground the almonds to a finer meal because they were a bit chunky for my liking. The apricots were magnificent, once we had exhausted ourselves opening the jar. I almost wished I had just eaten them by themselves. But I was so worried about the sponge not being right and brainwashed by E requesting butterscotch that I made a toffee or butterscotch sauce to serve with the pudding (inspired by The Vegetarian Society’s Apricot & Pecan Pudding with Toffee Sauce which BBC have amusingly renamed Bonfire Puddings with Tarantula Sauce.) The sauce made it more decadent than I had planned but it was amazing when soaked into the sponge with some juicy soft apricots. Fry onion and kale in oil for about 20-30 minutes on low to medium heat. 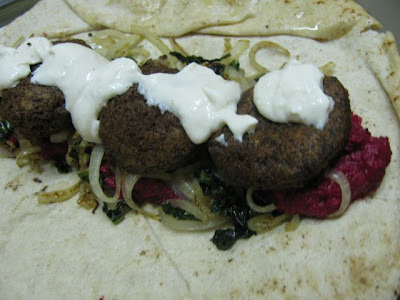 Meanwhile place falafel on baking tray and heat in moderate oven for 10-15 minutes. Mix tahini, lemon juice and yoghurt in a small bowl. Place pita bread in oven for 5 minutes till just warmed through. To assemble, lay pita bread on dinner plate. Spread with beetroot dip. Place 4 falafels on each pita and squash slightly. 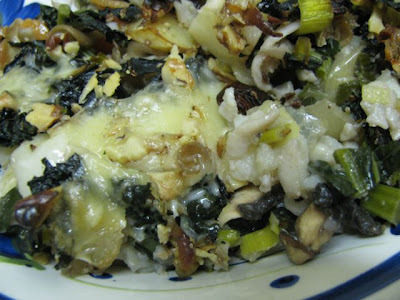 Scatter with kale and onion. Drizzle with tahini sauce. Roll up tightly and cut in half. 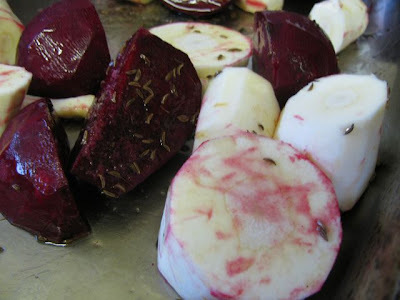 Toss beetroot and parsnip with salt, caraway seeds and two tablespoons of oil in a roasting dish and roast at 220 C for about 1 hour or until they are soft when a knife is poked into them. Cool slightly. 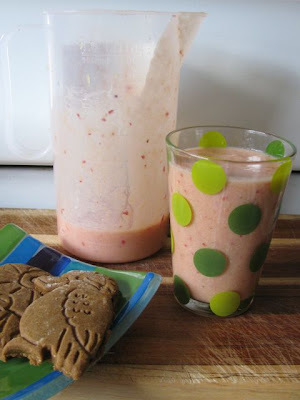 Blend in food processor with remaining ingredients. 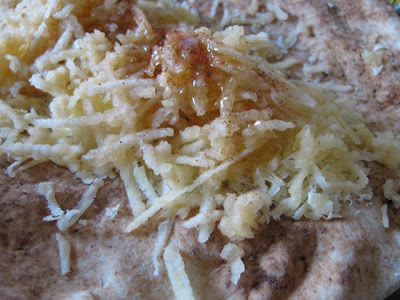 Sprinkle cheddar and then apple in a line along the middle of the pita bread. Drizzle with honey and sprinkle with cinnamon. Roll up tightly and place on a greased oven tray. Bake at 150 C for about 10 minutes or till roll is hot and cheese melted. Microwave chunks of cauliflower until cooked. This took me about 6 minutes. Microwave fennel till soft. This took me about 9 minutes. Alternatively, boil these vegetables. It is important for this dish that the vegetables are well drained after being cooked and the fennel is well cooked and has relinquished its crunch and the strong raw aniseed flavour. 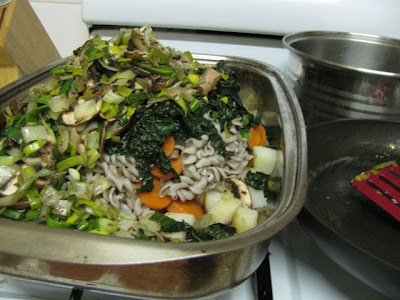 Arrange vegetables in a shallow baking dish. I didn’t bother greasing it. Make the white sauce by melting the butter in a medium saucepan. Stir in the flour over low heat for a few minutes. Add milk slowly, stirring constantly. Bring to the boil and once the sauce has thickened turn off the heat. Stir in cheese till it melts. Add spinach and dip. Spoon spinach mixture over the vegetables. 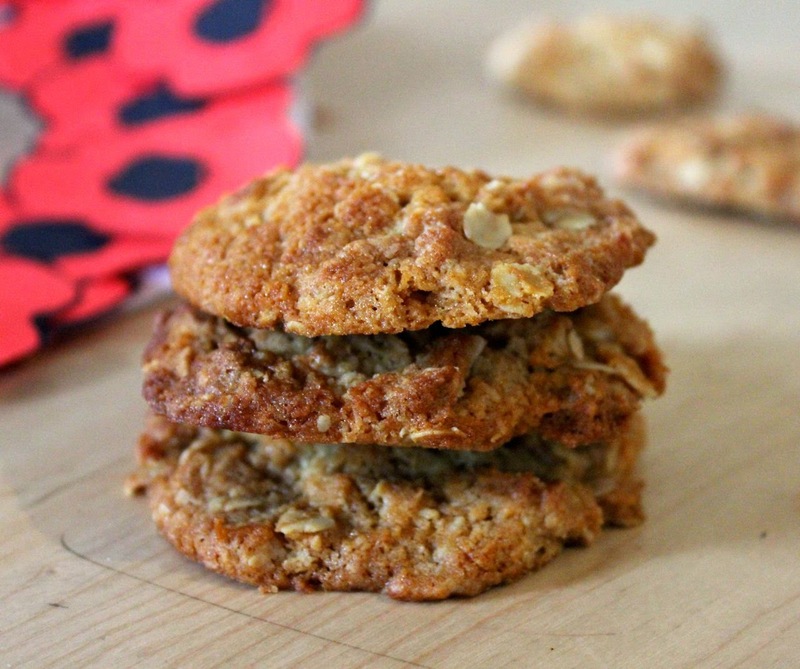 Scatter with cheese, breadcrumbs, sesame seeds and sunflower seeds. Bake at about 200 C for 1 hour or the topping is golden brown and crispy and the insides are bubbling. Serve with roast or steamed vegetables. In a food processor, puree the spinach, garlic, beans, scallions, basil and 3 tbsp of the lemon juice until very smooth. Fold in the minced artichoke heats and add more lemon juice and salt and pepper to taste. Serve chilled or at room temperature. 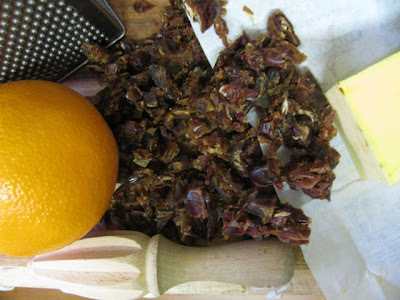 Place stewed apricots in a greased medium sized baking dish. Mix remaining ingredients in the food processor or by hand (I did these in the food processor as I had to grind my almonds first so then I put everything else in). Spoon batter over the apricots and smooth on top. Bake at 180 C for about 45 minutes and then at 160 for 15-30 minutes till cooked (I am still working out how to tell this – both apricot sponges I have taken out too early, the skewer has come out clean when I put it in the middle but when I put the serving spoon in the batter is not cooked and I have to return it to the oven). While sponge is cooking, make toffee sauce: place all ingredients in a small saucepan and bring to the boil. Simmer for 2-3 minutes til sugar dissolved. Cool before serving. It will burn your tongue if eaten straight away after simmering. But it is quite nice warm or even room temperature. NCR Like some pepper in your soup, blondie?